The twins have been so interactive and interested in items that we display on their Montessori inspired shelves. There is just something beautiful and attractive about seeing a neatly prepared environment. They naturally make their way to the shelves to explore and interact with the items set up. Even though I don’t get enough time to rotate the items on the shelves as often as I would like, the babies continue to explore their baskets in different ways. 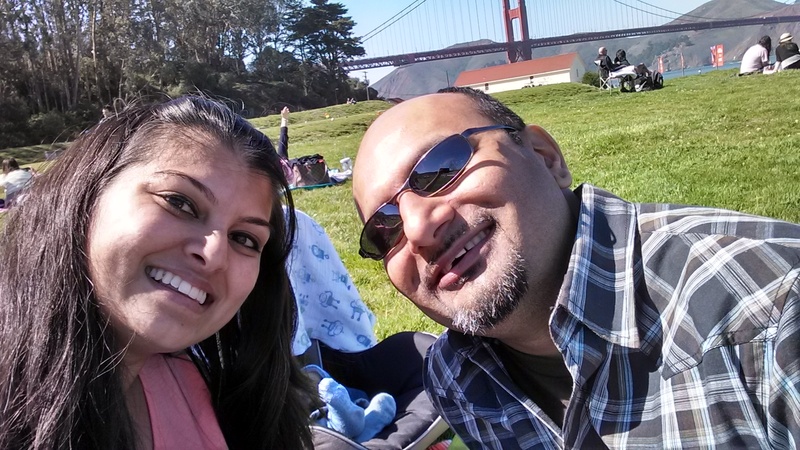 On the most part, we setup our Montessori environment with items we have around the house and I really like to put emphasis on the practical life aspect of it for all the kids. So, if your family, like ours, prefers to work with what you have at home rather than invest or replace existing items around the house, know that it is possible to do so, especially for the materials used between the ages of 0 to 3 years old. The baskets below were put together by big brother when the babies were about 6 to 9 months old. He was really excited to pick various toys which we had around the house and sort them into the baskets. During this time the babies were very much into putting things in and taking things out of the basket. Big brother enjoyed reciting the different colors to the babies and asking them to put the items in their respective baskets. 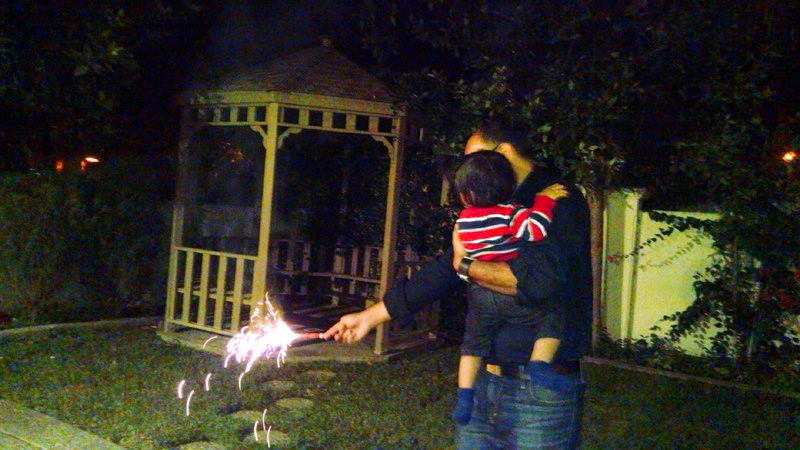 It was a fun, easy activity for both age groups. When the babies turned 1, we updated our baskets once again. By the time the babies turned 1, they were a lot more mobile and showed interest in a variety of fine motor activities as well as sorting. I created our most recent baskets based on observing what they do the most, this currently included stacking, colors, matching/opening/closing lids and shapes. Maria Montessori refers to various sensitive periods a child goes through, this is a time when a child unconsciously shows a very strong interest in learning a specific skill and will naturally excel in learning it during this period. Both babies have definitely been showing a sensitivity to order. 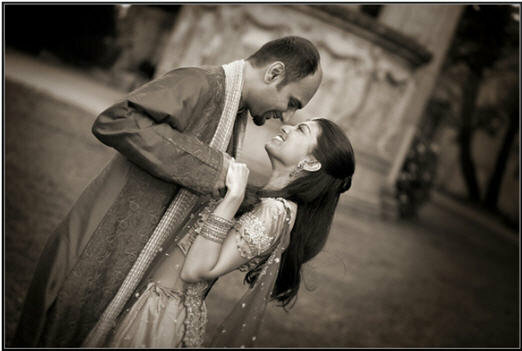 For Twin A it has been focused on shapes and sizes and for Twin S it has been with regards to color and shapes. 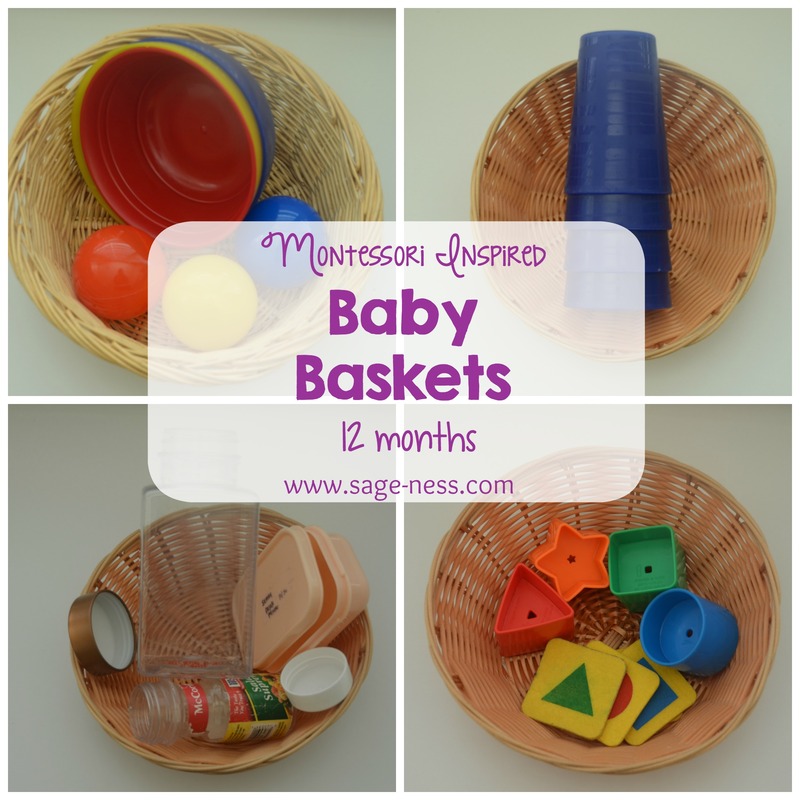 Our Montessori baskets for the age of 1 year are inspired by our twin babies sensitivity to order. 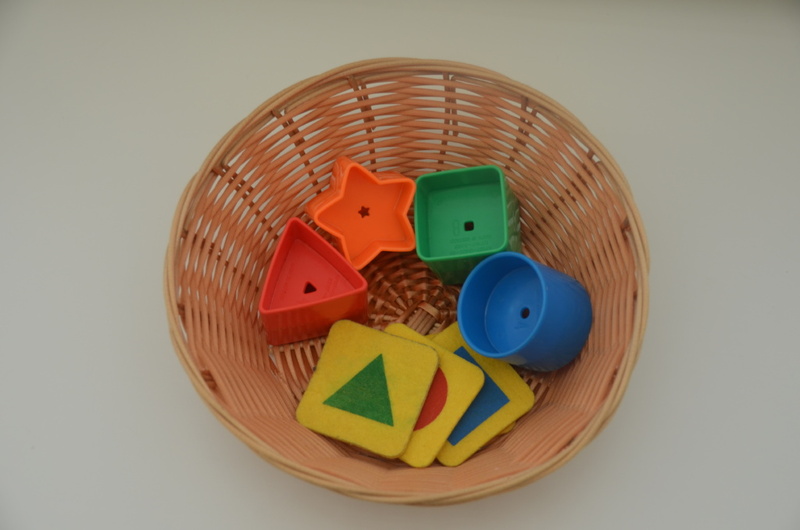 Color matching – With this basket the babies are able to focus on the primary colors while learning (without knowing) the beginning concepts of sorting, grouping and order. When twins first started this basket, they mainly put the balls in and out of a bowl. 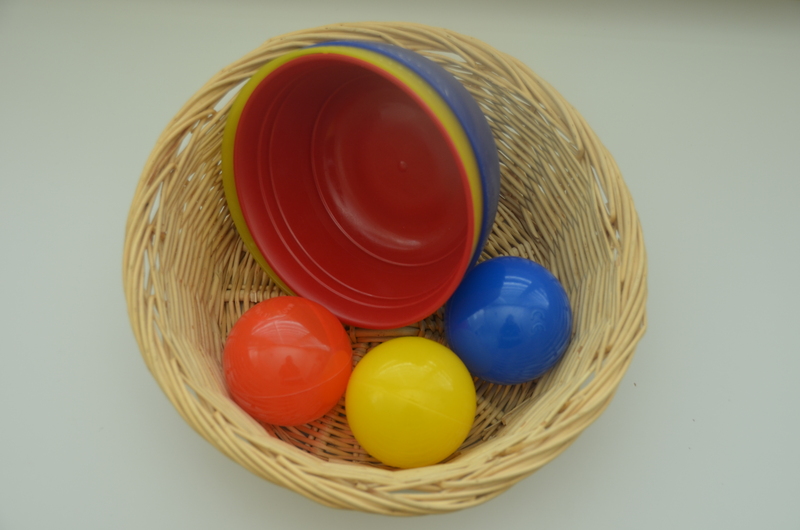 Over time, they have been able to identify the color of the ball and place it in the matching bowl. 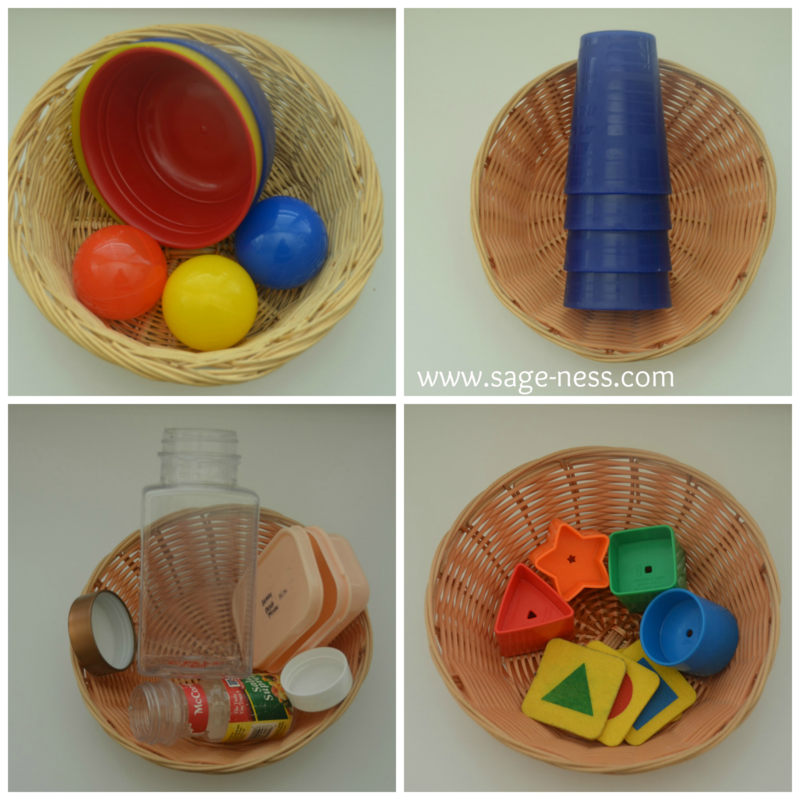 This is a visual sensorial activity which also aligns with early math concepts according to the Montessori concepts. 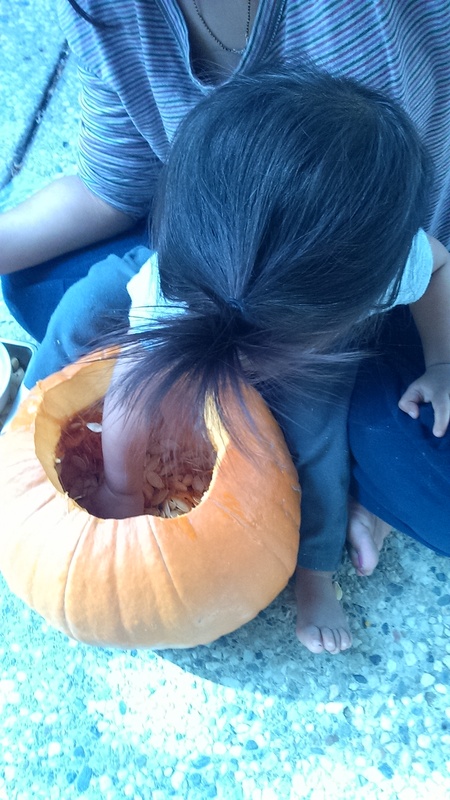 The babies also enjoy stacking these bowls as well. 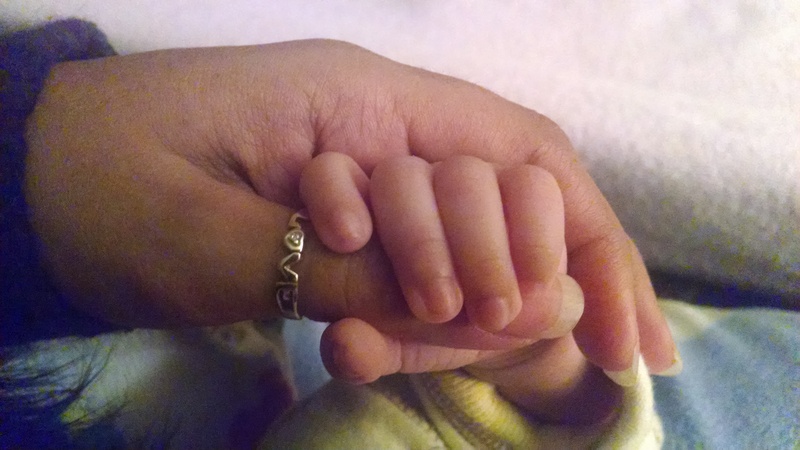 Stacking – Both babies absolutely love stacking. 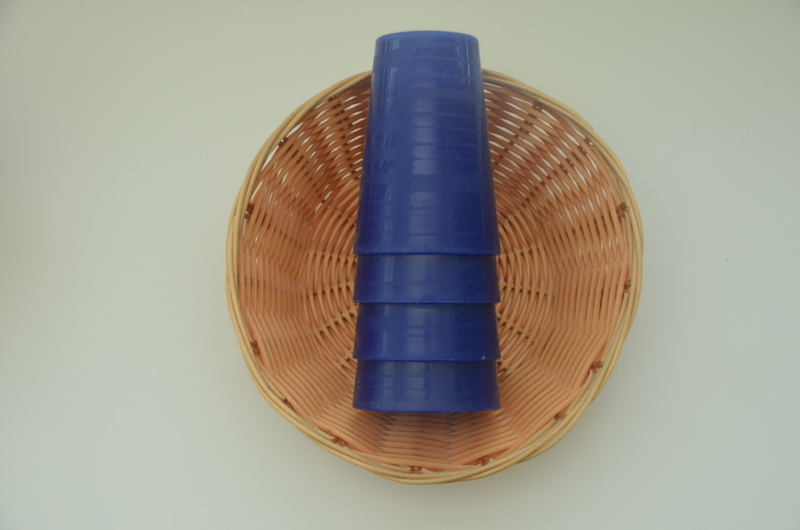 This has been a great simple way for them to practice their stacking skills as well as taking the cups apart. 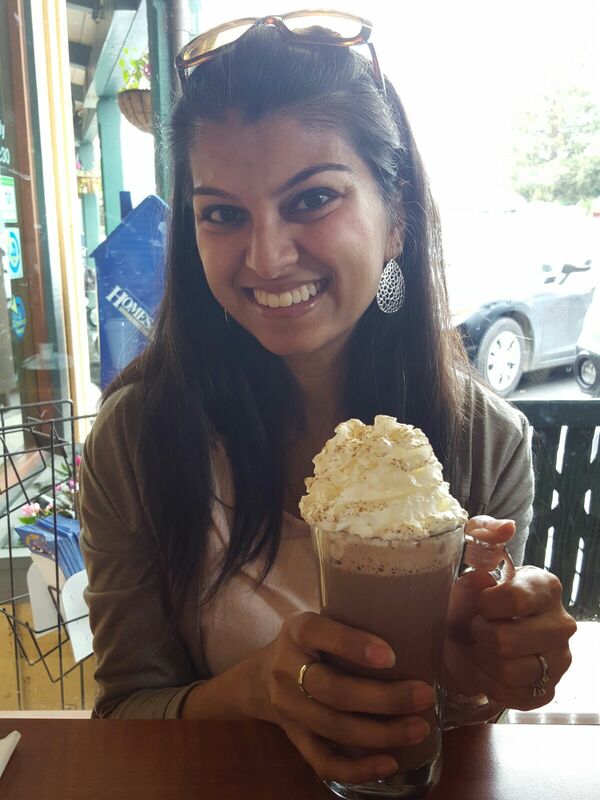 It not only develops some of their fine motor skills, hand-eye coordination as they align the cups to stack but it also uses their strength when they try to grasp the cups to pull them apart. 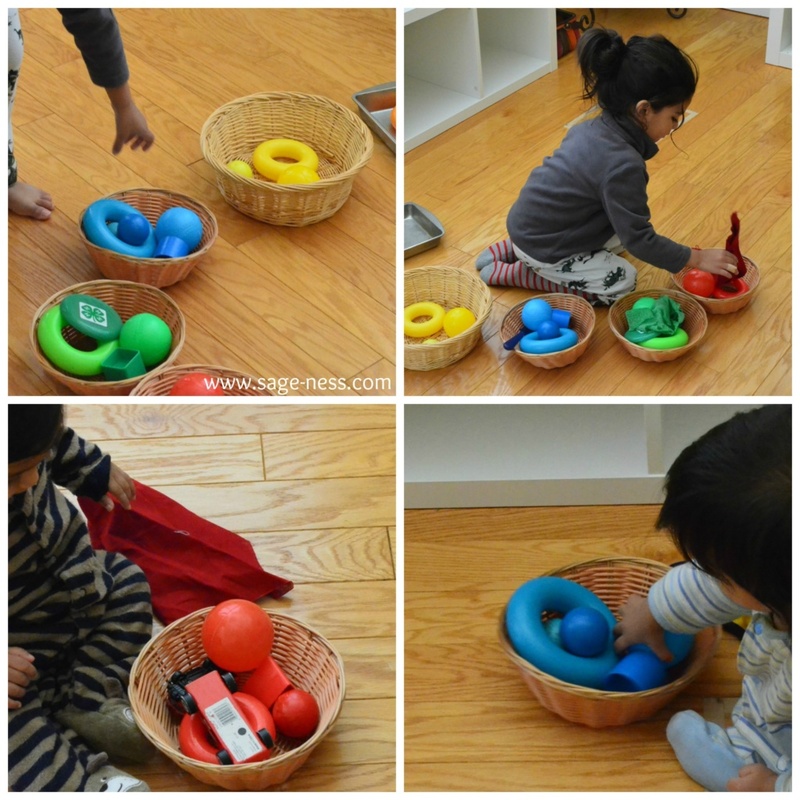 Matching lids – The babies have really enjoyed playing with their wooden ball and track, where they have to place ball in the hole and watch it go down it’s track. I’ve also caught them experimenting with other shapes to see if they would fit down the hole. As a result, I thought this matching of various sized and shaped lids would be fun to watch. They also end up taking the various sized balls that they have and put them inside of the bottle, creating their own rattles. Shapes – Originally, I though this would be a neat matching activity where we would sit together and put the shape on top of it’s appropriate shape cards. However, I didn’t like that the shape cards (part of another activity) were not the same color as the larger shapes. I thought this made it confusing. We still used this basket to talk about the various shapes in this basket and identify what color they were. The amazing thing is most recently (at about 13.5 months), Twin A has been able to identify where the cylinder goes in the shape sorter. As I have mentioned before, we have not invested in a lot of traditional Montessori materials but we try to improvise with what we have at home. Most of these items in the babies baskets we already had around the house. The shapes were reused the shape sorter that Big Brother used to play with. 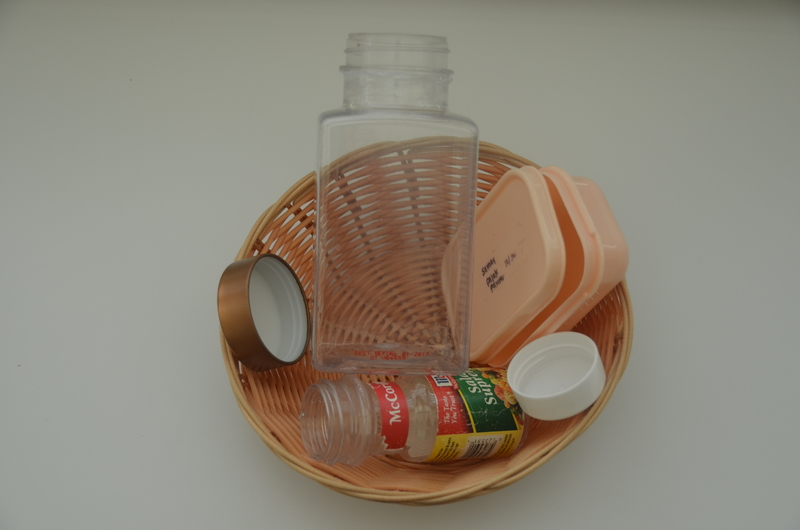 What do you have around the house that you can use for your Montessori inspired environment?